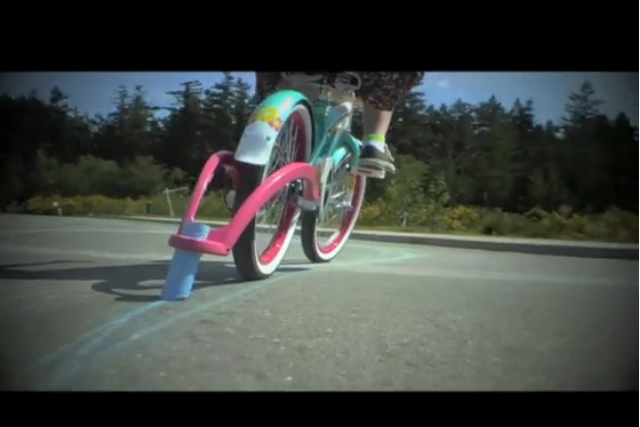 Use chalktrail to make your mark…in color! Photo by Kickstarter.com. Earlier this month, TheCityFix brought you Izhar Gafni’s $9 cardboard bike. The cheap and fibrous creation keeps good company in the world of innovative pedaling. This week, we’re highlighting a few that you can even invest in on Kickstarter.com. The web-based crowdfunding tool allows users to contribute scores of micro-investments into a creative team’s vision for social change, art projects and, indeed, bicycle innovation. Below, we highlight four awesome, if not whimsical, biking solutions that you can be a part of from the ground floor. Just in case you don’t recall the artistic wonders you created as a kid, remembering will be as easy as riding a bike. The chalktrail is a fun “third wheel” that rides along with you as a floating attachment, allowing you to blaze your trail on the urban roadway with chalk. Set to the street and mark your own path…in full color. The foodstuffs of pandas recompose the traditionally steel frame of a bike, much like Gafni’s cardboard one. This bike is out of the prototype phase and is equally cool. A San Francisco team has crafted an electric bicycle, designed for urban biking, even in the chilly hills of “The City By The Bay.” The Faraday, named for the British inventor and electrical pioneer, can add up to 15 miles of pedal assistance, which increases in strength with the driver’s own efforts. In addition to having amazing utility, it is also ridiculously good looking. A New Jersey designer has crafted a single set of light, adjustable “wings” that elegantly truck your bike’s load without any clunky racks. The wings, with the assistance of a bungie cord, balances with the weight of the bike to get your groceries or packages with you, without a heavy backpack…or aid of a cab. We’ve all had moments of genius on our bikes. Share yours and start your own Kickstarter campaign to see your dreams go from research to reality.